Synthetic Leather & Mesh Uppers.Soft and durable good looks, breathable comfort and no break-in period.New Performance Casual Last.Great Dexter fit with additional room built into the forefoot and toe box for improved comfort and fit. 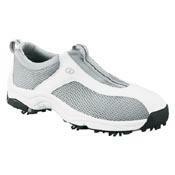 Snug athletic heel pocket for stability and support. Slip Lasted Construction.